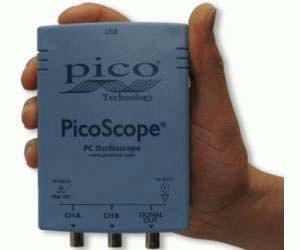 The small footprint of the PicoScope 2200 range means that you can take your PicoScope with you wherever you go. These compact oscilloscopes are small enough to fit in your laptop bag, yet offer the features and performance of scopes that are several times their size – and their price. The PicoScope 2200 dual-channel PC Oscilloscopes are capable of real-time sampling rates of up to 200 megasamples per second. For repetitive signals the sampling rate can be increased to as much as 4 gigasamples per second using equivalent-time sampling. These high sampling rates combined with a 16,000 sample buffer memory and 25 MHz analogue bandwidth make the PicoScope 2200 range suitable for use in a wide variety of applications. Your PicoScope 2200 is not only a powerful dual-channel oscilloscope: using the same PicoScope software for Windows that comes with our high-end scopes, you can also use your PicoScope 2200 as a spectrum analyzer, signal generator and arbitrary waveform generator (AWG). Using PicoLog you can also transform your PicoScope 2200 into a data acquisition tool that can log data over extended periods of time.